A study by the IBM Institute for Business Value demonstrates that electric vehicle manufacturers may not understand why consumers want them, how much they’re willing to pay for the vehicles, and recharging. According to the IBM study, many automobile industry executives believe that sales of traditional vehicles will peak before 2020 and are looking to electric-only vehicles (EVs) as one of the next hot products, but they will first have to address stringent consumer requirements about EV performance, recharging, and convenience, according to the survey of consumer attitudes and a recent study of auto industry executives. What’s interesting is the disconnect auto executives have on the reasons consumers would have for switching to electric vehicles. Significantly higher oil prices only drive about half of consumer interest while auto execs think it would affect 76 percent of potential consumers. Auto execs also think consumers are going to be swayed by government incentives or regulations (73 percent) while only 41 percent of consumers feel that way. Consumers are more than twice as driven by traffic congestion for driving electric and also, just like early hybrid adopters, they want to be seen as green for going electric. The price of the home charging installation often required to support an EV could pose an obstacle to consumers buying EVs. Only 13 percent of drivers said they would consider spending more than $1,000 to retrofit their residence to support recharging of an electric vehicle. According to industry estimates, retrofitting to a 240 volt outlet accessible to vehicles averages between $1,000 and $2,000. 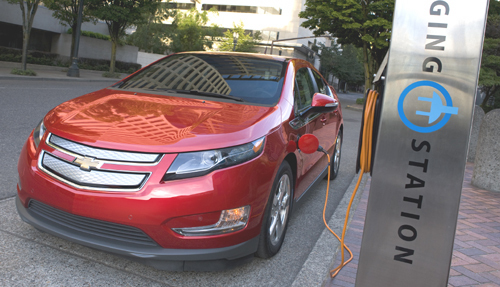 The study indicates that, even in these early days, there is a potentially large market for EVs. Nineteen percent of drivers surveyed said that they were either “very likely” or “likely” to consider purchasing an electric-only vehicle when shopping for a new car. This is notable, given that 42 percent of drivers know only “a little” about EVs or have “only heard of them,” suggesting that automakers could increase the pool of potential buyers with sustained educational campaigns. What probably most pleases manufacturers from the study is the conclusion that 40 percent of drivers said they would pay up to 20 percent more for an electric-only vehicle compared with a similarly-featured gas-, diesel, or hybrid-powered vehicle, with 27 percent saying they would pay 10 percent more and 13 percent saying they would pay 20 percent more. One can just smell the markup coming to electric vehicles, especially if government tax credits continue.